Young Life, from the perspective of a first timer. Sophomore Ryan Mokandu and junior Jace Trachsel blow eggs to each other. Young Life is a club where students get together to talk about their life and their faith. Club meets every Monday at various homes. Everyone’s invited to come, and it’s fun! The team gave me an assignment to tackle down: go to Young Life, make an article on it and get a page dedicated to Young Life on the yearbook. I figured this would be the perfect time for myself to learn more about a club that has always tickled my fancy. Young Life, according to the Burnsville High School activities handbook, is a club that “provides a fun and safe place for students to be together and talk about their lives and faith” and states that everyone is invited to Young Life. That’s right, everyone. That’s you. And you. And even you! Last Monday was my first time – ever – in my life – at Young Life club, hosted this week by BHS senior Mari Belina. Long story short? The hugest and most lit house party I’ve ever attended. It was school sanctioned, too, so no alcohol or drugs! Sober party? I like that. I drove to the Belina residence and parked my car. I had to put that in the article because, holy crap, parallel parking a car in the rain AND the fog? That’s work. But I did it. Be proud of me. I walked into the home and was greeted by host Belina and her two dogs. (I know, I had to put the dogs in there.) Down the stairs I went into the basement, where senior leader Tyler Anderson stood, waiting for the large (and I mean LARGE) group of people to come in. It was the calm before the storm. And, slowly but surely, the crowd starts trickling in. One, by one. At the end, we had the whole basement jam-packed with BHS students. All grades were being represented, from what I saw. Club officially kicked off at 7:34. Why 7:34, you may ask? “It’s just a goofy, funny thing.” club leader Brad Fendler said. We first played an icebreaker activity, where we play rock-paper-scissors, and whoever loses has to crawl under the winning person’s legs, and form a train. At the end, every person was on one train, and the last person had to crawl under every single person’s legs. Well, that was interesting. Afterwards, we played a game. They called up volunteers, and everyone wanted myself to get involved in this game, so I tackled it down. They didn’t tell me what the game was until after I was called up. What was it, you may ask? There was a clear tube, with raw eggs inside. One person had their mouth on one end of the tube, and another person on the other end. I went against sophomore Ryan Mokandu. We both had to blow into the tube, and whoever blew the raw eggs into the other person’s mouth won. Mokandu won the match against me, so there was raw egg all over my face. Nice! Okay, that was pretty fun, not gonna lie. The big thing about Young Life is not only the fun you have with each other, but also everyone getting together to talk about their faith with God. Senior Marika Sy spoke to the entire group about her faith to God, and how Jesus has helped her in life. I am a Christian, myself. Not a “go to church every Sunday” Christian, but the rest of my family is part of the Christian religion, so it’s in our family. We do go to church occasionally, for Christmas service and other “major” things, but we’re not committed to go every Sunday. It was actually super cool to see everyone get together and talk about their faith and their commitment to God. Along with that, it’s just cool that everyone can get together and talk to each other, regardless of their faith or religion. 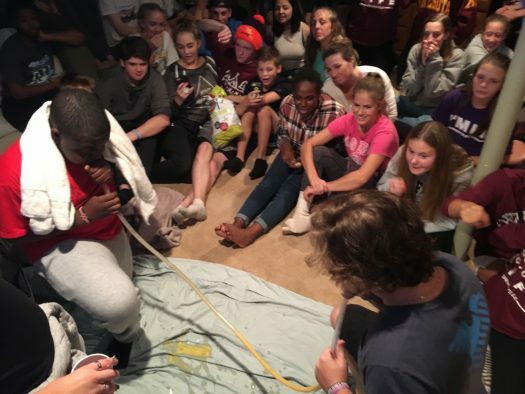 Along with Young Life, the flagship club for Burnsville High School students, there is another club, called Wyldlife, which is essentially the same club for Burnsville students at the three middle schools. There is also a club called Capernaum, which is for adolescents ages 14-21 with disabilities. If you haven’t been to a Young Life club get together yet, you should definitely consider going to at least one meet. It’s super fun and it can be inspirational to some! Young Life club meets every Monday night at 7:34 at various homes throughout the community. They’ll tweet the host’s home and their address every Monday on their Twitter account, which you can find @BvilleYoungLife. Long story short? It’s a great time.